38mm 18K white gold case, 18K white gold bezel set with baguette diamonds, highly scratch-resistant crystal, black dial with diamonds, automatic movement with hours, minutes, seconds, lavish strap, ceramic bracelet. Water resistant to 30 meters. 38mm 18K white gold case, solid back, 18K white gold bezel set with diamonds and cognac sapphires, highly scratch-resistant crystal, pave dial with precious stones, automatic movement with hours, minutes, seconds, approximately 42 hours of power reserve, pave strap, white gold bracelet, triple-folding buckle buckle. 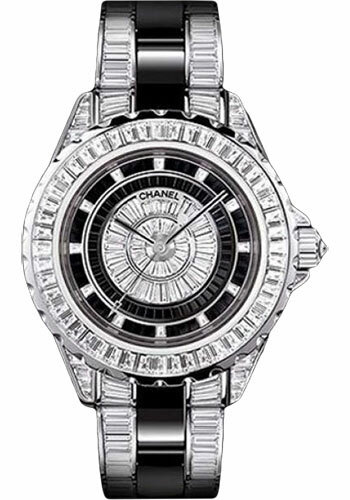 38mm 18K white gold case with more than 1000 brilliant-cut diamonds, crown set with a brilliant-cut diamond, 18K white gold bezel set with lavish white diamonds, black dial with white diamonds and 12 black diamond hour indicators, automatic movement with hours, minutes, white strap, white gold bracelet. Water resistant to 50 meters. 38mm 18K white gold case, 18K white gold bezel set with white diamonds, black dial with 12 beautifully-cut white diamonds, automatic movement with hours, minutes, seconds, white strap, white gold bracelet. 38mm 18K white gold case, solid back, 18K white gold bezel set with baguette-cut diamonds and titanium case back, black dial with baguette diamond, automatic movement with hours, minutes, seconds, black strap, ceramic bracelet, triple-folding buckle buckle with diamonds. Water resistant to 50 meters.